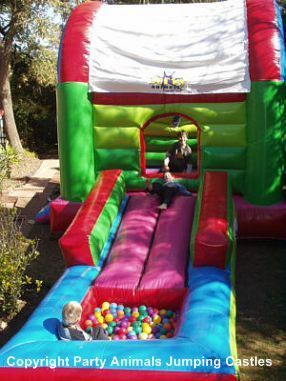 The Large Slide Ball Castle has proven to be extremely popular. Kids love the bright colours and large play areas. The castle has a roof which protects against the harsh Summer sun and rain, and in Winter the castle is partly protected from the wind and cold. Motor is a 1.1kw motor with a 15m extension lead. If the power point is further than 15m from where the slide will be placed, you will need to supply an additional extension lead. These are not provided by Party Animals.